The Mount Morrisey banquet room with generous double patio doors allows for natural illumination. An outdoor patio walking out from the banquet room creates the perfect setting for your guests to relax underneath the stars with a view of Mt. Morrisey. The Hearthstone Lodge at Sun Peaks offers 70 condo-style suites that are spacious and welcoming – a refreshing change from corporate hotel offerings. Your guests will really appreciate stretching out in their suite in front of the fireplace. They will also enjoy the convenience of a efficiency kitchen, cable television and complimentary wireless internet. 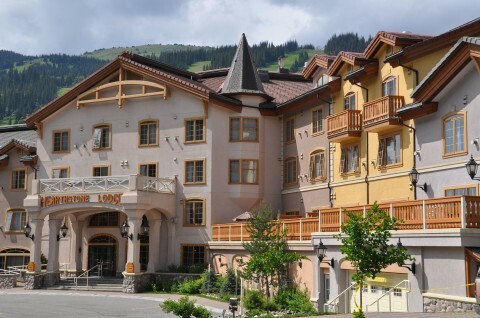 The Hearthstone Lodge is pleased to partner with Peter and Tina Ernst, one of Sun Peaks Resort’s most prominent Restaurateurs – proprietors of Bella Italia Ristorante and Powder Hounds Restaurant. Bella Italia Ristorante, located down the hall from the Morrissey meeting room, will cater to your group’s requirements. Bella Italia boasts fine Italian and Canadiana cuisine for elegant plated and buffet dinners, receptions and celebration events.